This article will be our reviews of the best pH testing kits do use to monitor your water for hydroponics. There are many different types of meters to choose from so we’ve listed our favorites of each type, along with going over many common questions that you may have. 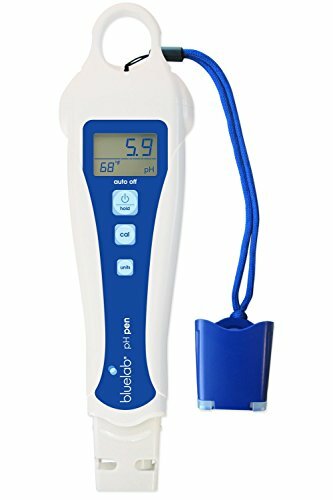 The Bluelab PENPH pH Pen is a digital pH meter designed specifically to assist growers in plant germination. As you know, plant germination is crucial to any hydroponics endeavor as it is the first step in growing plants. This digital pH pen can easily detect the pH level of the water as well as its temperature. The ability to detect the temperature of the water is extremely useful if you like logging the fluctuations of pH and temperature in the tank. It is also equipped with a highly visible LCD display and a calibration monitor so you know that your device is ready for regular use. It is recommended that you first calibrate the digital pH pen before using it regularly in your hydroponics system. And you won’t have to worry about water seeping into any of its compartments as it has been rendered completely waterproof. The Apera Instruments Pocket pH Tester is designed to provide fast and accurate readings and is ideal for most water solution testing scenarios, not just in hydroponics. It is sleek, light and the company behind it has been producing pH meters and other similar products since 1991. The best thing about this pH meter is that it has a built-in intelligent system that ensures consistency and reliability in regular use. The manufacturer also states that it also has a built-in self-diagnosis feature that will warn the user if the calibration is off or if there’s something wrong with the current measurement. 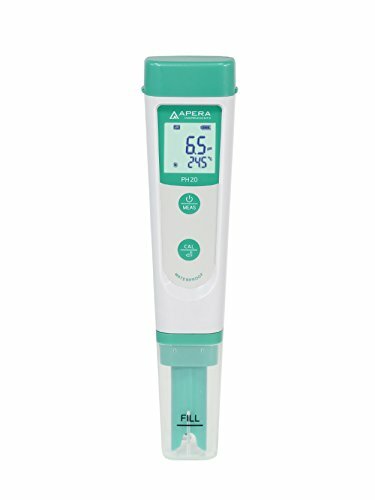 The Apera Instruments PH700 Benchtop Lab pH Meter is a digital pH meter that has a 3-in-1 function, can be calibrated prior to use, can detect temperature fluctuations in the water and also has automatic compensation. There is also a built-in compensation mechanism plus self-diagnosis so that the pH meter can detect if there inaccuracies in the measurement and can warn the user, accordingly. 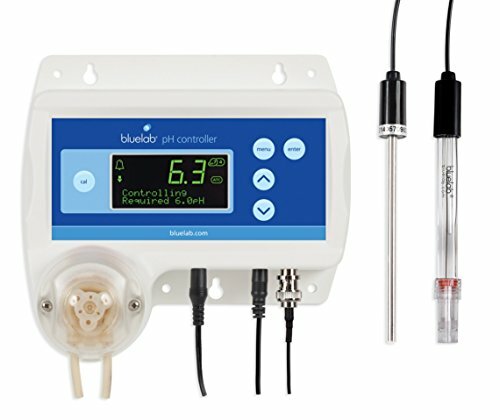 The Bluelab CONTPH Controller pH Monitor is not just a digital pH monitor, it is also an automated solution for adjusting the pH level of your nutrient solution. As we all know, pH levels can easily vary on a day to day basis the daily monitoring process can be tedious, to say the least. What’s interesting about this device is because it is fully automated, it can be set by the user and the rest will be up to the device. It will help fine-tune your nutrient solution so that it attains the right pH level which will be awesome for your crops. The pH controller can control the pH of the nutrient solution from a range of 0.1 pH to 13.9 pH. Set the exact pH level that you need and the machine (together with the sampler solution that comes with it) will take care of the rest. 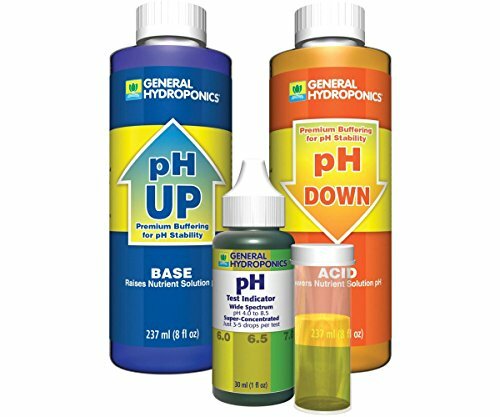 The General Hydroponics pH Control Kit is an all in one solution for fixing the pH level of your hydroponics system. It includes a manual pH testing indicator tube for manually checking the pH level of the water. The package includes a pH down solution (for alkalinity), a pH down solution (for acidity) and a testing solution (with the test tube). The pH (power of hydrogen) level of a hydroponic nutrient solution is the measure of the alkalinity and acidity of the water. Is it important in the overall scheme of things? Yes, it is. It is of highest priority if you want your plants to be able to uptake as much nutrients as possible, while growing to full maturity in a full hydroponic environment. If anything, hydroponics is the most man-made system around if you think about it and the fact that you control even the contents and the volume of the nutrient reservoir means you’re going to be the one in charge for fixing even the pH levels of your system. The pH level of water is so important that plants can suffer from nutrient deficiency issues even when the nutrient levels are ideal. The pH will be the one barring the plants from proper uptake of nutrients. That’s how harsh things get in a hydroponic environment without proper pH buffering. How Do You Buffer The pH? Buffering is the process of adjusting the pH level of the water so that it reaches a certain level. Alkalinity and acidity are not essentially good or bad in themselves. It just so happens that plants require a certain pH level in order to thrive. Ideally, the pH level of a hydroponics solution should be slightly below 7.0. Now, in the event that your nutrient solution reaches that particular pH level, don’t add more nutrients to your reservoir. Instead, buffer the pH level of the water and then add your nutrients. Adding nutrients when the pH level is on the rise can cause further spikes in pH, and this can definitely make things more complicated than you’d like them to be. What Kind Of Adjusters Are There In The Market? There are two types: solid and liquid. The older variants come in solid or powder form, while the newer ones are made in liquid form and have additional chemicals thrown in to help buffer the water more quickly. Our suggestion is to buffer the water when you monitor the pH in the morning (or whenever you do it within the day) and make sure to check and readjust the pH before leaving. Changes in pH can take place fairly rapidly, depending on the effectiveness of your pH up or pH down solution. We also recommend using liquid fertilizers that have pH buffering capabilities to lessen your work as a grower. These nutrient mixes come in liquid form, usually. How Does a pH Meter Measure pH? Measuring the pH level of water can be fun! Especially if you’ve never tried doing it before. 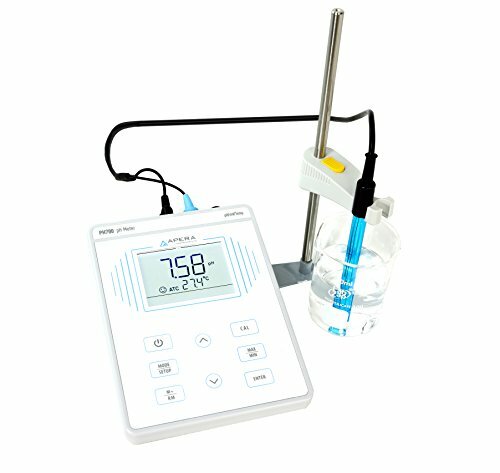 There are two types of pH meters in the market. The first one (which is also the oldest and is used mainly for swimming pols and aquariums) is the manual type – the litmus paper. When you use a piece of litmus paper, all you have to do is fill a test tube halfway through and drop the paper in. After being submerged in the solution, the strip of litmus paper will turn to a particular shade of blue or pink. You will then consult with a color chart to identify the probable pH range of the water that you are testing. Are manual tests accurate? Yes, but only to a degree. You can use manual testing of pH in the event that your digital pH meter breaks down. Mainly because litmus paper only gives us a probable range and not an exact figure. Hydroponics is very particular with pH. Your plants will not die with a pH of 7.0, but at this pH level, nutrients will begin to precipitate and stick to the walls of the system. These changes are undetectable to the human eye, and yet, they have massive and far-reaching consequences for the hydroponics system. Digital pH meters are ideal for hydroponics – because we need exact figures, not just probable ranges. Believe it or not, a pH meter works a lot like a voltmeter, or a device that measures the voltage of an AC or DC power source. The concept behind measuring pH digitally is actually quite simple. Water with low pH has more positively charged hydrogen ions. This means there is more potential to generate electric potential. The digital meter merely measures the electric potential created by the introduction of the water. When the electric potential fluctuates, then the pH goes up – toward the range of alkalinity which is roughly after 6.0. We generally recommend using a reliable digital pH meter so you can get accurate, spot-on results whenever you monitor your hydroponics system. It can be difficult to decide if you need to buffer your nutrient solution or not, by just looking at litmus paper strips. There are two main types of digital meters that are popular in the market: plain pH meters and combo pH meters that can be used to buffer the pH directly. Combo pH meters are fascinating because these devices help automate the process of changing the pH level of the water. When you load a combo meter with a buffering solution, the machine will add the buffering solution to the water and monitor the fluctuation of the pH. When the desired pH level has been attained, the machine stops but may be set to continue monitoring the acidity of the water. While pricier than regular meters, we think that this is a good investment especially if you have a large hydroponics system that has a lot of high value crops planted in it.